Children in the Pre-Kindergarten class attend school five afternoons a week, allowing their friendships to deepen and their skills in all areas to grow. Games and ideas evolve throughout the week, adding complexity to the children's relationships and their play. With larger groups of children playing together, those involved in a game learn how to play with someone who does not always share their interests and ideas. A child's desire for a game to continue becomes more important than always playing a game their own way. 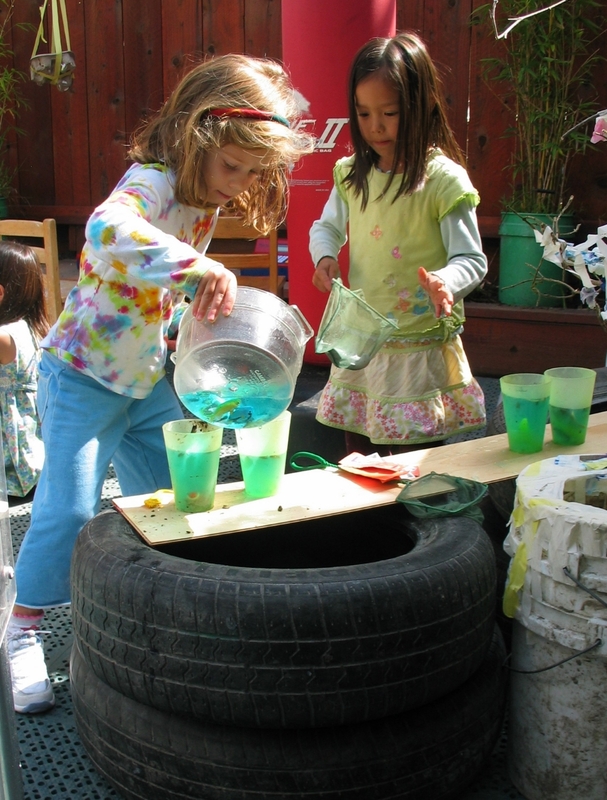 Children then discover that collaborating with others will lead to more interesting play. This more advanced form of play also creates the need to advocate for oneself when things happen that are not fair. Children use the problem-solving skills they have developed in earlier years at Peter's Place to resolve conflicts without the help of an adult. Multiple children will work together to find a solution to a problem that will benefit the entire group. The desire to "keep the game going" often drives this leap in social development and helps children see the value of compromise. In the Pre-Kindergarten class, child-centered free play is balanced with structured teacher-directed time when children are given a limited number of activities to choose from. The teachers plan "choice time" based on the needs of the individual children and the group. These activities may range from drawing about a particular topic to building more complicated block structures, to playing a board game with a new person. During this part of the day, children practice important skills like risk-taking, perseverance, waiting for a turn, listening to a teacher's directions and following through on a planned activity. Pre-reading and math are incorporated throughout the curriculum in a playful way. Honing such skills is an important part of preparing for the transition to kindergarten. Children leaving the Pre-Kindergarten class are able to self-advocate and work with others, which enables them to take the next step in their education with confidence. This confidence in turn allows them to focus on new challenges like reading, writing and arithmetic. The children arrive and play inside the classroom. The outside area opens at 1pm. Children break into 2 small groups to meet and talk as a group, then choose between 3 different activities planned by the teacher. The children choose indoor or outdoor activities. There are teacher-led and open-ended tabletop activities set up inside the classroom. A healthy snack is offered at a table with a teacher during Free Play. Each day one child will write up the snack menu, feed our classroom fish or shake the tambourine to announce circle time. Children return to their small groups to clean up and prepare for the end of the day. A teacher then leads the children in songs, stories, body movement, music, games, finger plays, and dramatic play. Children gather together to share a story before saying goodbye.